today we took our review class and had a little discussion about next month's lesson. we are really very hopeful about our kids. all of them are so intelligent and smart. it was so fun today..
how is your life going? hope all of you are doing great. today, kids had a wonderful day at school. they have learnt so many things and were very attentive during the study time. kids enjoyed a lot while they playing at the park. we also danced with some songs. it was so fun today. wish all of you have a great weekends. We are getting back to warm weather again, and surprisingly it was our youngest who want to take the ball to the park. She is getting better at kicking ti too. We had another visitor today who quietly watched some of our lesson. Our student didn`t let me down and did their lessons well. Hello, We had a full house again today, they are all good kids, but trying to make them sit still for a moment is like getting cats to sit in a line. They all did there lessons well and they were all eager to go to the park, This time we had the orange ball to kick around , chase and throw and a few of the other kids at the park joined in too. We had a full class today, all our kids were here, and the lesson still went rather smoothly. They all did well, building on the improvement they have all made. The weather wasn`t too bad, so we were able to get to the park and play, surprisingly it was very busy. We couldn`t play with the ball, but we had fun in the sandpit instead. 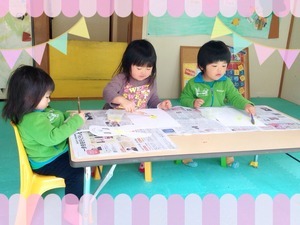 today, we have successfully completed one of our tricky lessons. the best part about the lesson was that the students enjoyed it. when our lesson finished, we played with some blocks. we made lots of things like buildings, bridges and so on. we also played with the colors :) kids like to color things according to their imagination. finally,we went to the park like we always do and had some wonderful time. how are you all doing? hope you all are having a great time. today our students were so happy because they completed their lesson very nicely. and also they enjoyed playing with sandpit and also singing the number song. it was so fun today. we really enjoed a lot. Oh no! The weather is rainy. It is always a shame when we can`t go outside to play. We had a wee vistor today anyway so there is always lots of things to show him. He joined in on our lessons and he was very good too, I hope he will become a full time student. So instead of the park we dance jumped around and drew lots of things on the magnic boards. Another beautiful warm sunny day! Hooray! Today, I noticed that one of my student has made a big step forward in his learning, it is such a great thing to watch them improve. So after our lessons we went to the park to play with the ball again, it is endless fun, but tiring. When we got back to school for our lunch, our youngest was so tired she fell asleep in the middle of her lunch, poor thing.